Today I wrote my 4th exam in 4 days and it officially marks the end of my summer semester at UBC. With my university graduation in sight I decided to grind through 3 summer courses over the past 6 weeks. Lucky for me, this brutal amount of school work also beautifully coincided with some very heavy training loads as part of our intense preparation for the upcoming Commonwealth Games. But now with my exams complete I can sit back, relax and whine about it in a blog post….Just kidding, but I am relieved to have school finished and put all of my focus on field hockey. After some strong team performances this year against the U.S, England and Wales, the Commonwealth Games will be a fantastic test for us. Commonwealth Games offers us some top competition, we face New Zealand, India and South Africa in our pool alone. The tough competition is a challenge itself, but it’s also accompanied by the added pressure of a tournament setting where performing and fighting for those 3 points each game is crucial. After 7 weeks of focused, intense training the team is well equipped to face this challenge and we’re eager to learn and continue our growth. Mentioning the added stress that being a student places on an elite athlete’s shoulders, an unfortunate and continuous stress on mine, and the team’s shoulder’s is money. For the team’s development it’s important to play a variety of top teams in the world…and living in Canada mean’s they are usually geographically far away. As much as I truly appreciate travelling the world playing a game that I love, I am very aware of how much this life experience all costs. I have set up a CHIMP fundraising page. CHIMP is an online charitable giving site, and as soon as you make a simple online donation to my group you will receive a tax receipt. To help me kickstart my fundraising they will match every dollar you donate (up to $50s a donation)!! If you would like more bang for your buck I’m up for a challenge, some ideas are donating $30 for each goal I score, or $20 for a game day dedication or social media shout out. Maybe even $1oo for a selfie with Usain Bolt in the athlete village in Glasgow? I’m open to suggestions. Here is the link to my donation page, thank you for taking the time! And remember every donation will be matched, so every little helps! 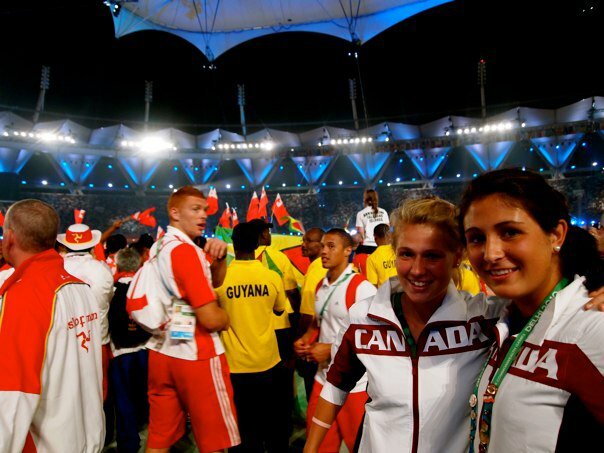 Here’s a throwback to last Commonwealth Games, Dehli 2010! Well I have finally passed the 100 cap mark! After a bit of confusion with the English Hockey admin staff, our originally planned 4 game test series became a 2 games test series with 2 practices matches, therefore my 100th cap turned out to be the second match played at Bisham Abbey. Coming up against England, ranked 3rd in the world, we expected if nothing else to put up a good fight. Unfortunately in my 100th game for Canada, England showed us why they are 3rd in the world and why we’re not quite there yet. Playing against these top teams is always a wake-up call for us, but that being said our team understands that we are young and relatively inexperienced compared to these teams; our average age roughly 5 or 6 yrs younger and our average caps maybe reaching a 3rd of theirs, so we know we have a long way to go. What’s great about facing these teams, and why we eagerly accept the challenge, is that you learn so much after losing; you’re forced to be better, you analyze your mistakes, learn your lessons and accelerate your growth. And grow we did…..by the end of series we came up with a 1-1 tie, after leading 1-0 for a majority of the match. Finally solid scoreboard proof of improvement and perhaps more importantly our belief being justified. Belief is a word that has often come up in my National Team career. Being part of a team desperately trying to claw our way out of 23rd in the world, the one thing you absolutely have to have is belief. And even as a young player I always thought I had belief in our team. Lining up against any team, even world number 1 Argentina I believed that we could somehow pull out a win. However, I’m now discovering it’s not the belief before every game that moves you up in the rankings, it’s having the belief when you’re back at home training. 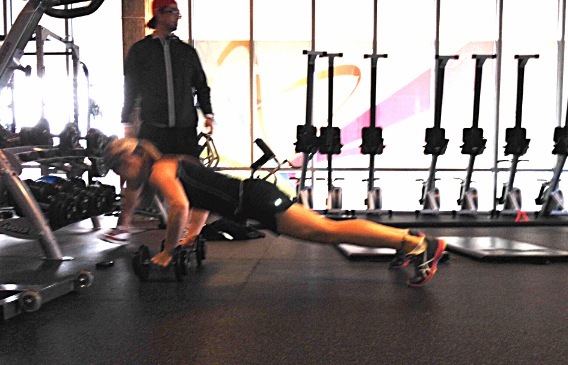 We talk about commitment and sacrifice when we’re in a centralized training environment. Making it to the same field every day, at the same times, working with the same people day in day out, and working what seem to be the same drills over and over. Every practice you try to bring your best, or the best of what you have to offer each day. Then when you go on tour and don’t get the results you wonder why you’re doing it. If only you could guarantee a certain amount of hours of training would translate to moving up those 5, 10 or 20 spots. But in sports there are no guarantees, on any given day any team can win. And building up a young team is a process; sometimes it’s hard to remember the wins aren’t always the ones on the scoreboard. Somehow you have to keep the belief and stick through the grind without the concrete results. Having lost every game against the U.S, Australia and England (all top 10 ranked teams), it was hard to ignore the score and focus on the improvements we were making. However knowing we had a long way to go, we diligently soldiered on, slowly watching our possession and attacking stats creep up. At the start of the England tour we beat their development squad, and we could see our game was becoming more consistent. However, we were then smashed in our first test match against England. But we knew, we believed, we could be better. So when that second game came around, we weren’t panicked, we didn’t stray from the process and build a fortress around our 25yr line. We believed we weren’t just going to compete with this team…we were going to beat them. Sure enough we were up for most of the game. A look or feeling of shock didn’t wash over our team when we were up; we continued to believe in our game, in our process. After pulling their goalie in the dying minutes of the match England managed to equalize, but we had just tied the number 3 team in the world. We finally had tangible evidence that our process is working. …but it all came after the belief. We now return home for 7 weeks of training in preparation for Commonwealth Games. I looking forward to attacking this training with new sense of encouragement. We know the training is worth the daily grind and more importantly we believe in this group, in this team, not just game to game, but everyday. A couple of weekends ago I competed with my University team in the Vancouver Field Hockey Premier League Championships. Wow that was a mouthful. These two championship games were played just a short week after returning from the US tour with the National Team, this allowed me to bring into perspective the differences between international and domestic competition. Obviously there are some big basic changes; international hockey is much more fast paced, causing your decision making to be quicker and your skills to be sharper, buying you crucial seconds of extra time. What was even more helpful is that I now play center mid for both the national team and my club team, so I can also compare my roles and positional play in each team. However, I’ll admit I try to sneak into the forward line as much as possible with my club team, I can’t resist the lure of glory goal hunting! After playing center mid with my club team shortly after adjusting to playing with the National team, I noticed that not only does the game change, but my game changes a little too. I play much more freely With my club team, I search for open space and I’m better able to get a real feel for the game. However with the National team I am much more conscious of my positioning, and am less likely to go searching for space and flee from the positioning plan. Obviously in international competition tactics become a more crucial part of the game and the team has to adhere to a structure and game plan, but to what extent? Being a center mid on the national team there are a lot of spacing and other players I have to be aware of, well I’m in the middle of the pitch so I’m literally surrounded. But upon review I still think I can be more adventurous and start to manipulate my spacing more. I suppose it’s the fear of making mistakes that holds you back. But in life I have never been someone afraid to make mistakes, and trust me I have made a lot; I’ve been stranded in the Frankfurt airport, I’ve crashed a car in Thailand, and I’ve shaved the side of my head. At the time some of these mistakes feel horrific, but the reality is you always get through them. And here I am, made it through and took some lessons with me like listen to your mum’s (and pretty much everyone else’s) haircut advice…..and crashing a car in Thailand didn’t make me afraid to drive in foreign countries, but maybe a little more careful….and I also learned a lot about the Thai insurance system…..like bargaining with the rental car manager’s friend for a repair price. My point being, in life and on the field the fear of making the mistake is often a lot worse than the repercussions of the mistake. Mistakes are inevitable, the difference is the source. I would much rather make a mistake because I’m pushing myself to be better, or trying something new. I’m heading into 2014 taking more of this fearless attitude to the field with me, and very conscious of continuously pushing myself out of my comfort zone not just physically but also mentally. Alrighty, first tour of the year has come and gone. Honestly I don’t have a whole lot to report about the trip. It was a short training tour consisting of 4 games vs. the US and things were pretty much business as usual. I’m happy to say that due to focusing on our own game for the past 10 months or so, the team now has a strong foundation and understanding of our structure. Therefore we no longer feel as though we’re starting from square one every tour. After our performance I’m excited to see how much we are able to build onto this foundation in the very busy year ahead! Playing 4 games this past series has landed me a grand total of 99 international games played for Canada. Being so close to the big 100 benchmark has gotten me thinking about what my experience has taught me, and if there are any solid take homes I can share….and I came up with a lot of different answers! And all of these answers were so interconnected it was hard to sculpt out one useful message…hence the delay of this post! Here’s my choice, and I hope it’s helpful! The answer I chose to write about is somewhat of a continuation from my last post. I finished my last post encouraging you to take your strengths, and unique talents and use them to your advantage. So I’m taking that idea and transferring it directly to the pitch, sharing with you a trait of mine that I have managed to turn into a strength on the field. In the last post I mentioned I have a slight problem with over analyzing. Off the field it’s a bit of a burden, especially when it comes to field hockey and feedback from coaches. I will take a message think it and re think it, apply it and interpret it in a million different ways until I come to some kind of a conclusion of how it applies to me. I think (after over analyzing it) I do this because it’s how I like to learn. By asking many different questions it forces me to look at things in many different ways. This style of learning, asking questions and searching for answers, can be exhausting and time consuming. So you can only image the possible disaster if this thinking was to manifest itself after a mistake on the field…. For many of us, when you make a mistake you start questioning yourself, thoughts like “OH SH…just kidding….questions like: “am I nervous?” “Am I having a bad day?” “How many mistakes am I going to make this game?” “Is my hit just off today?” The problem with these questions is that there are no real answers and therefore no solutions. If I can’t come up with answers and solutions I keep analyzing, and this will continue until I’m so into my own head that I would probably forget how to hold a stick. So how do I turn this analyzing into a strength? I have learnt to shift my questioning and mentality to problem solving. The reality is, I know I can hit a ball, and my fundamental ability to hit a ball is not going to change throughout the course of the game. So there is absolutely no use in questioning that, so what changes in a game? In a game your skills are affected by factors like time, pressure, and positioning. So when I miss a ball, I question why, but the questions I ask are: did I give myself enough time? Was my spacing right? Did I pre-scan and know where I was going to hit it? Did I lift my head? The key to this questioning is that there are simple answers available and therefore potential solutions. This thinking shifts your mindset from questioning your ability, to questioning what’s inhibiting your ability. The first set of questions you’re analyzing why YOU can’t hit the ball, but in the second you’re questioning what factors prevented you from hitting the ball. This is a very subtle shift, and even typing it I feel as if I just said the same thing twice. So to better explain, let me address how this shift can help your game. This thinking benefits your game in a number of ways; firstly, you’re increasing your game sense, analyzing your positioning and learning how to improve it. Everyone needs time to execute skills, learning these simple and effective ‘tricks of the trade’ to find time gives you much better understanding of the game and how to manipulate space. Secondly, this thinking keeps your head in the game; in order to analyze your positioning you have to be constantly aware of what is going on around you. Thirdly, and I have saved this for last because I think it is the most important, yet the hardest to explain…. This subtle shift in mindset detracts you from questioning your ability. Focusing on only your ability places the responsibility on internal factors, which are immediately unchangeable, and therefore will erode your confidence during the game. Instead, what the shift does, is focus on the external influences of the mistake, which leads you to problem solving in your environment keeping you in the game and adding to your confidence. You’re no longer blaming your skill (which is immediately unchangeable) but your decision making and positioning that can easily be changed, offering you hope and encouragement. Some sport psychologists tell you snap a band on your wrist, forget a mistake and move on. But in a math class if you get a question wrong, you don’t give yourself a slap with a ruler and forget about it, you learn from it. For me I need answers and I need to keep learning. Every game, every play, and especially every mistake is a learning opportunity. Overanalyzing is how I like to learn, and I have found a way to make it work positively for me. I wanted this blog to be honest, and share with people what is on my mind, so the topic of this post is something I’ve been thinking about all week. I tend to be an overthinker and this post reveals a bit of my analytical side, more specifically my desire to understand not only people’s actions, but also their motivations…. I suppose what it all comes down to is understanding empathy. Don’t worry I’m not attempting to write about a psychoanalysis here….just sharing what’s been on my mind. Recently a team was selected to travel to the U.S and play in a 4 games series against the USA. During the last week of training, those selected have a new motivation to train for upcoming series. But what about those that weren’t named to the team? Who now have to practice with the team, knowing they’re preparing to send them off on a tour they wanted to be a part of. I have been fortunate enough to have been named to every tour and competition since joining the Canadian Team in 2009. Being named to the team is something I will never take for granted, but also something that I will never just be satisfied with. The only team I will be truly satisfied with is being named to the team that’s going to the Olympics. Although I was named to the U.S tour this time, I know what it feels like not to be named to a team. I wanted to take this opportunity to observe and understand the feelings of my teammates that weren’t on this team list. We’ve all been there, the team list is announced, you don’t see your name and that bottomless pit you’ve felt in your stomach all day finally hits bottom, and the sinking feeling consumes your body. The english have a good word for this: gutted. You don’t see you own name, so you begin to analyze those players who’s names are on the list. Then you begin to compare yourself to them, because logically you assume this list of players must represent the standard. You begin to compare yourself almost in a denial mindset, that you should’ve made the team; well she got a lower fitness score than me, she didn’t train well last practice so I should be on the team. But then you remind yourself that you weren’t selected, so if she got a worse fitness score, or a worse hit or whatever you singled out, then how bad must you be for her to make it over you? The comparison game is a road to nowhere. The way I see it is that the coach already has a picture in his mind of you as a player. Only you can change that picture, no matter what any other player does, it won’t affect how capable he thinks you are. So it’s not about comparing yourself to other players; finding their weaknesses and making sure they are you strengths, finding their strengths and trying to match or surpass them. The reality is you don’t know what the coach sees in them, if you don’t know that then how can you make him see you are better than them? Each player has a unique talent or style, and you can either shape that to fit what you think the coach wants, or you can express it fully, showcasing your talent in a way that will make the coach find a place for you on the team. I’m not telling you to showboat, never listen to tactics, and ignore advice because it doesn’t suite your style. What I’m saying is, you’re never going to make yourself into another player on the team, so don’t waste your energy fighting against your unique talent. Use this talent to make yourself stand out, differentiate yourself from players don’t compare yourself. The coach thinks he knows what he wants, show him something better. Shifting this mentality from being the best on the team, to being the best of yourself. For right now being the best on the team has an end point, an achievable goal that can cause a team to plateau, we need to stretch ourselves and realize being the best on our team isn’t good enough. We’re slowly pushing standards forward, but in very measurable ways. If every player starts pushing to improve every aspect, every single element of their game, these standards won’t be as measurable because every player is raising the bar in their own unique way, and we’re all bringing that much more to the table. There is no flat standard or one ideal player that every player needs to play like. Bring to the team what makes you great and push to improve it everyday. Here’s a picture of my teammate Ange. She has been injured for 6+months, but she’s been pushing herself in every possible way as hard as she can, and I have been truly inspired by my teammate. Alright this post came totally from auto-pilot. This is something important to me so please read. Last year I signed up the UBC Women’s Field Hockey Team to particiapte a Relay For Life. Relay For Life is an overnight charity event that raises money for cancer research….. So many people have been touched by cancer in some way, I remember sitting in a class and the prof asked everyone to stand if they knew somebody who had battled with cancer….every single person, in a 300 person lecture hall stood up. Whether it was a friend, loved one, relative or neighbour, some of these people won their fight, some did not. At this relay for life event we were fortunate enough to hear the survival stories from the incredible people who had succeeded in their battle against cancer. I was almost going to use the word triumph in that sentence, but there is nothing triumphant about being able to hold onto your own life. Listening to their stories you know no one can put themselves in their shoes, no one can feel their pain or understand how hard they had to fight for something so basic as their life. Fundraising events like Relay for Life, that show up on your newsfeed or in your email, present you with a choice. We are fortunate enough to donate something like $5 which you may not even think is worth it, but it’s something. You can choose to ignore it, or you can choose to invest in someone’s life. People absolutely deserve to be given the best chance to fight for their life. It doesn’t take many people to invest a little, to make a big difference. I’m sure there are many people that can come up with many arguments against donating, or why this does this cause deserve a donation over another. I can’t answer that, all I want to do is present you with a choice: to click on the link below and donate anything, or choose to ignore it. Choose to ignore it, and think that you won’t make a difference, or thinking someone else will do it. Everything, even something like cancer treatments and cures, has to come from somewhere…..that can be you. Olympic Games – Who Do You Play For? Sochi 2014 has been the talk of the town. You can strike up a conversation about the Olympics with a Starbucks barista, a classmate, a prof, everyone is invested and cheering on Canada. I don’t know the first thing about Ice Dancing (I believe most Canadians are claiming the Olympic Judges don’t either after Tessa and Scott’s silver) but I find myself glued to the T.V screen, informing my friends of the athlete’s life story and past record. In the age of social media and the immense Olympics coverage both online and on T.V, spectators across the world feel closer to the athletes more than ever. As athletes were arriving in the village to participate in the biggest competition of their lives…many articles revolved around the toilets…. At first I found this quite distressing, athletes going to the Games, a competition they have spent 4 years training for, and people are more concerned with the construction zone that was the athlete’s village. But as the events started, news of the athlete’s amazing achievements and incredible stories came rolling in. Past the thousands of messages of support seen on Twitter and the news, I found different stories constantly showing up on my newsfeed. Stories of a Canadian cross country ski coach helping a Russian skier with a broken ski, or Gilmore Junio giving up his spot in a race because he believed Denny Morrison had a better chance at a medal. These are the stories that people are gravitating to and supporting by sharing all over social media. The Olympics are a celebration of human success. Olympic Medals represent hard work, dedication and athletic ability. Seeing these stories of athletes, or countries helping one another on the most competitive stage in the world shows the success of human values such as selflessness, empathy and compassion. I love that these moments have been highlighted in the Games, for me it opens my eyes to the bigger picture. Yes sports are competitive, and yes we want to win, but at the end of it all, what are the true achievements of your career? The medals and world records, or the inspiration that you have provided to so many? Is a world record your name in the news or in the history books, validation and recognition for your hard work? You know that that record won’t last forever, someone will break it and there will be a new name in the books. With each new record or medal you are pushing the sport forward, inspiring the next generation to be stronger, faster, better. When you’re competing you are really only competing against yourself. To improve, to have a chance at success simply means beating yourself to that finish line. That’s the only thing you can control in sports, you can’t beat everyone else by making them worse, only by making yourself better. So to win this constant battle against yourself, training or playing with just selfish motives will surely leave you in a stalemate. You need a bigger inspiration to drive you past your limits and that little voice in your head telling you to stop the pain. That inspiration comes from realizing what you represent, all those you can inspire whether it’s your teammates, future stars of your sport, your Nation or even your mum. Once you recognize this and appreciate it, you can then harness all of this support or energy. I’m having a hard time properly articulating this theory of mine so please allow me to put it as simply as I can….This battle against yourself I mentioned earlier, if you come to this battle field with just yourself, meaning you are just playing for yourself, and your opposition is yourself then you have two equal forces against each other. Drawing inspiration from the bigger picture and playing for something bigger than yourself takes you to the battle field with all of this artillery behind you, an overwhelming force to defeat that part of yourself telling you to stop. Playing for someone or something bigger than yourself will push you so much further. Sometimes you have to step back and look at the bigger picture so you don’t get stuck on a narrow path to success with just you and yourself. In the summer of 2011 the team was in a brilliant place and feeling optimistic about our approaching Olympic Qualifier, the Pan American Games. I was extremely motivated, and with no school during the summer I spent my days at the field and on the track. Due to the lack of competitive domestic competition in Canada the team would play matches against an U18 boys team. These games challenged the team to combat the boy’s strength and speed with technical and tactical smarts. During one of these games a particularly tall boy, who hadn’t quite gained full coordination over his limbs, came barreling down the field towards me. Stepping in to tackle we collided and I left the collision with the ball and a broken rib. Just for a quick reference point, a broken rib is excruciatingly painful just when you’re trying to get out of bed, let alone during a workout! For the first week, pushing myself to do any heavy breathing, along with the usual pain accompanied with running seemed ludicrous, but eventually I built up to it. I developed a funny running technique hugging my arm to chest almost as though I was trying to cradle my rib. On one of my runs I was so focused on the pain and getting through it I ran straight past my house! My first game like session back was at the new facility for the Pan American Games in Mexico. All I can really recall is being incredibly nervous and then becoming frustrated because I couldn’t bring myself to reach or tackle. After getting knocked a few times, although painful it helped. At least then I knew and felt the pain as apposed to battling the fear of the unknown. I spent most of the tournament in physio treatment having needles stabbed into me in an attempt relax my muscles that were so desperately trying to protect my rib. My body was recruiting any breathing muscles to get air into my restricted rib cage which left me with a very tight thoracic region. I won’t dissect every pool play game because I don’t want to bore you…. and because I really don’t remember. But I do want to discuss our game against Argentina. Argentina was ranked #1 in the world at the time. Facing a top team can be mentally challenging and intimidating, but not for me. I was convinced that no matter how good a team was, they had no right to score on us. I’m not sure if this is coming from sheer stupidity or a masterful sport psych mindset. Don’t get me wrong, I believed scoring on these top teams presented a very difficult challenge, but my mind was made up that there were no excuses for defence. My reasoning was that defence required discipline. I recognize that there are very talented defenders with the ability to read the game, intercept balls and win impressive tackles. However, I believe defence on the whole simply requires discipline, and the fitness to maintain this discipline. If these two ingredients are present then a team is able to hold up the fortress surrounding the goal for 70 minutes. In the first half of the game it became apparent that we didn’t care what team we were playing, we were hungry to win. The first half ended with a 4-3 lead over Argentina. Then during half time break you could see the reality of leading against the #1 team in the world start to sink in. Entering the second half, a combination of our new fearful mindset and a newly motivated Argentina left the final score at 7-4 to Argentina. It’s not so much the loss that was hard to take, but the role we had to play in it. Knowing that we had to take a lesson from the Argentina match, we looked forward to playing Chile in the bronze medal game. We had played Chile a number of times leading up to the Pan Am Games. Our most recent game against them was a victory, nicely coinciding with my 50th cap, at Champions Challenge in Vienna. Neverless, the games against Chile were always close so we knew we were in for a good battle. However for this battle, I’m not sure if we left our artillery at home but the team began to crumble shortly after the first whistle. The psychology of a team has always baffled me. The source of the mood can never be pin pointed to a precise reason or isolated moment like a quite warm up, a struggling player or yelling coach. No matter how many sport psych tools we had, once the team felt like it was falling apart it was a downward spiral. In hindsight my theory is that we were a very tactically run team. Different teams required us to have different rotations and presses. I think this caused players to lose confidence in their ability and the ability of their teammates, so when things weren’t working we didn’t trust ourselves to simply connect the passes and play the game. Slowly but surely the game slipped away from us. The feeling of desperation and hopeless was screaming inside me during the dying minutes of the match. We lost the game 3-0, the most we had lost to Chile in the most important game. At the end of the game the combination of exhaustion and emotion left me lying on the ground gasping for breath, writhing in pain from all my body had gone through this tournament. I’m not a dramatic girl…..but I was an absolute mess. Walking back into the changing room I saw champagne on ice in the sink. In that moment I wanted those 70 minutes back. I wanted to be back at the start of the game with the sweet taste of opportunity and optimism, instead of the bitter disappointment that was now being forced down my throat. At the end of a game, or even an tournament like this you can’t help but ask “did I leave it all out there? Was there anything more I could have done?” At that point I thought the answer was no. My legs could not have given any more, I didn’t know what else I could have done with my positioning or plays. But the key part of that sentence is that I didn’t know. It’s only upon reflection that I realize I already have a preconceived picture in my mind of what I think my maximum effort is. It’s only when you surpass your limits that you know they can be higher. We will never know our best because the closer we get, the further our potential grows. I chose to discuss this theory with this tournament because I had so many excuses to say I performed only to the best of my ability. The tournament could have been an opportunity to push other parts of my game to unknown levels in order to compensate for my physical state. Or even more specifically my broken rib could have forced other parts of my body to perform at new levels, that I might not have been able to otherwise achieve. So how do we push ourselves to find these new limits and break free of this perceived potential….I haven’t quite figured that out. But I do believe being aware of it is a key step. It could start with a mindset of focusing on the undefined heights, rather than the created restrictions. Or even realizing what or who’s standards you are limiting yourself with. There are no limits, there is no trying your best because these are all self created ideas. We know they are self created because when we approach these limits we create new ones. Pan Ams showed me how much I could push myself when I’m injured, now I need to understand how to reach towards the endless potential I have when I’m healthy. As Russell Brand so simply put “the Universe is infinite, and time eternal”.…..our world is limitless, so is our potential. Hello world! Or more realistically…..Hello close friends and family! I created this blog to share my thoughts and feelings as I journey through life. Until recently I have been very apprehensive about blogging. I desperately want to avoid writing a blog in which I sell myself as a ‘nothing can ever get me down’, ‘my grass is green even in the Artic’…. kinda gal. Not to say that I will be throwing myself a pity party on every blog post either. I attack life with determination and vigour, the world is my oyster and this attitude will be reflected in my posts. However, I’m not going to use this blog as a string to display my shiny pearls. I want to share the story of how each pearl was made, the work and failures that go into it, because that’s what makes it truly valuable. So after much deliberation here I am, staying true to my life motto of “nothing ventured, nothing gained” and journeying into the blogosphere. 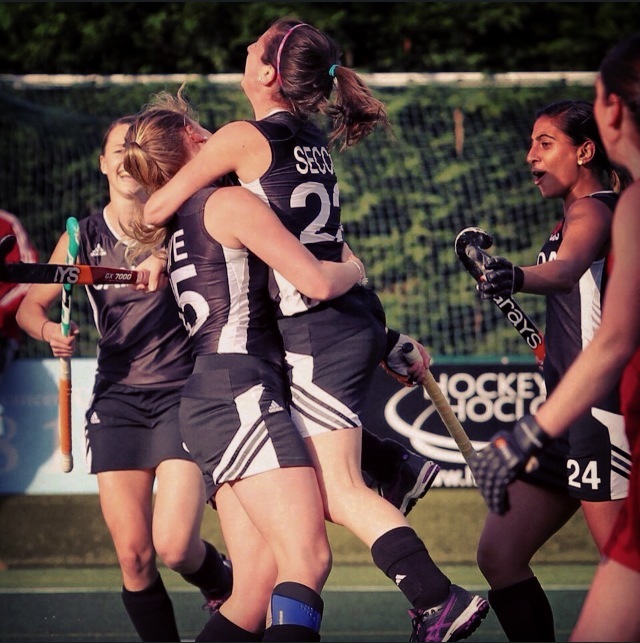 I hope to blog about all different aspects of my life, however as field hockey plays such an important role I can see it taking centre stage. 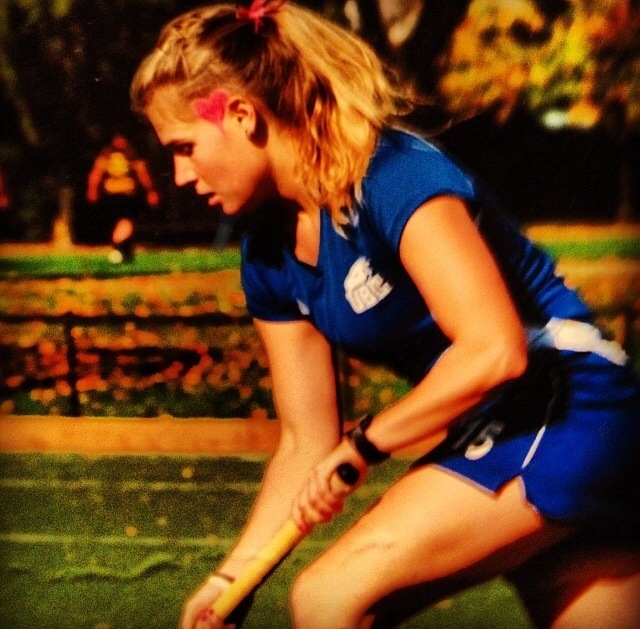 I also want to blog about field hockey because I find the life of an amateur athlete quite perplexing. We put ourselves through such mental and physical strain, not motivated by money, but driven by the love of the sport and the goal of reaching the pinnacle of success, the Olympic Games. The world of amateur sports seems to sit at an awkward juxtaposition to the ‘real world.’ Your pursuit of excellence in the sporting world helps you develop work ethic and other related characteristics that are transferrable to the ‘real world’, but success in your athletic career doesn’t directly lead to success in the world. Therefore the motivation behind striving to reach the Olympic Games is so pure. It validates years of hard work, and pretty much putting our lives on hold, to play the game we love, and for 2 weeks you are one of the top athletes in your sport. For the moment my absolute focus in life is reaching the 2016 Olympic Games. I must admit to having occasional life reviews when I realize there is a world outside of field hockey, and that one day I need a career that will most probably be totally unrelated to my sporting career. These conversations usually end up with the conclusion: until I have suppressed my appetite of reaching the 2016 Olympics there is little room for me to focus on much else. I’m 23, I’ve got time for the rest of life. The awkward parallel position where I believe amateur sports to lie in the ‘real world’, leads me to another puzzle piece of my life, school. 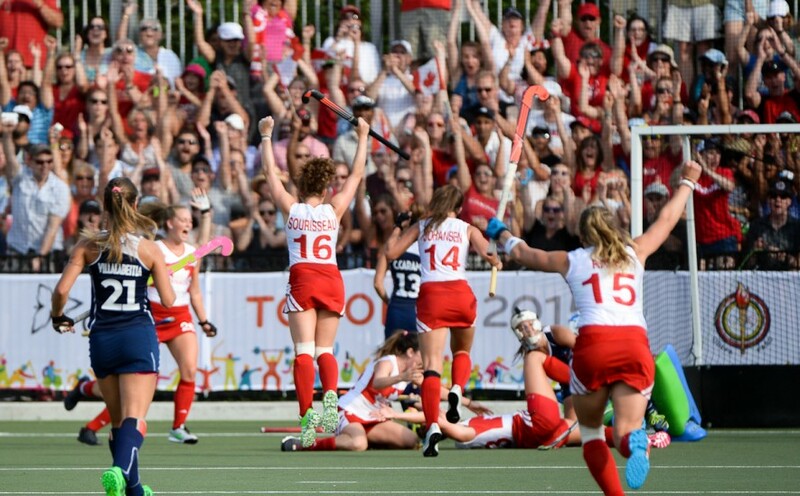 I am currently a Kinesiology student at UBC Vancouver, and although I recognize and appreciate a good education, I would be lying if I said field hockey, and more specifically the Olympics, weren’t in the forefront of my mind. When I take a step back to look at the balance between education and my athletic career, I find myself viewing school as some kind of a side bar. The viewpoint on my degree is not to gain knowledge and guide me towards my future career, but a necessary step to check off so I can focus on something currently far more important, the Olympics. Those on the team that aren’t pushing through an undergrad degree are focused on playing, and working part time or a flexible full time job that allows them to travel with the team. My point being even after earning a degree, no one is on the fast track to a career, and to be fair I don’t think you can be. I believe this leads us to depreciate our undergrad degrees. We don’t view our degrees as building towards our career, or our pathway to the future, just an obstacle to navigate. Maybe this is only a field hockey player’s perspective on education while playing as the longevity of our careers allows us to attend school while playing? This very bold opinion of how I believe field hockey players view undergraduate degrees is a beautiful segue into my next point…. Whether I’m reviewing struggles with injuries, or sharing something that has inspired me, or in the previous case a sharing a somewhat outspoken opinion…… all thoughts, feelings and opinions are completely my own.